Harvest manufacturing is a very large (275k sq ft) building and is a full-service fabrication, assembly, powder coating, and packaging entity. We manufacture for companies outside of the renewable industry and leverage all of that knowledge to manufacture products used directly for Harvest installations, as well as, selling products to other industry leaders. Epoxy/Polyester Hybrids combine excellent decorative appearance with excellent protective properties. Epoxies are used where optimum mechanical and chemical resistance is needed. Urethanes provide very good corrosion resistance and flexibility. Highest gloss combined with good exterior durability. Suitable for thin film applications. Polyesters offer excellent light and weathering resistance. Suitable for thick film applications. Since 2001, In-house Powder Coating has been ISO 9001:2000 certified. 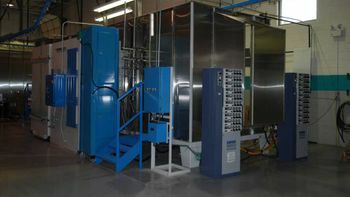 In-house Powder Coating services and processes are known for high quality and broad capabilities. Environmentally friendly, free of solvents, easy to reclaim and recycle. See What Harvest Manufacturing Can Do for You. We invite you to visit our offices and manufacturing facility.